If you want to know who are the top 10 Most Viewed Profiles on Linkedin – see List below. 1) Barack Obama: Current President of the United States of America. Linkedin SEO – How to be found on Linkedin – what keywords should I choose and what else matters ? Well, there you are with your new state of the art best practice Linkedin Profile which is extremely well worded and your picture taken by a professional photographer. You are ready to land a fantastic new job through a recruiter coming across your profile, but month and month passes and nothing ever happens…. First of all there are now more than 200 Million Profiles on Linkedin and steadily growing. How should a recruiter find you ? Not every recruiter has the Linkedin Recruiter Version which allows him or her to search through all the Linkedin profiles. And even if he or she did, how would your Linkedin Profile turn up in the top 10 search results of this recruiter ? 4) Analyse Keywords – do you know them and do you use those in the best way ? 1. First Login into your Linkedin Account. 2. On the right pane as shown in the picture above you will see how big your network currently is and if your profile appeared in search results. 3. In the section Who’s Viewed Your Profile click on the “Your Profile has been viewed by x people in the past x x” Link. 4. On the right upper side of the displayed new page click on the “Appearances in Search” Tab under Trends. 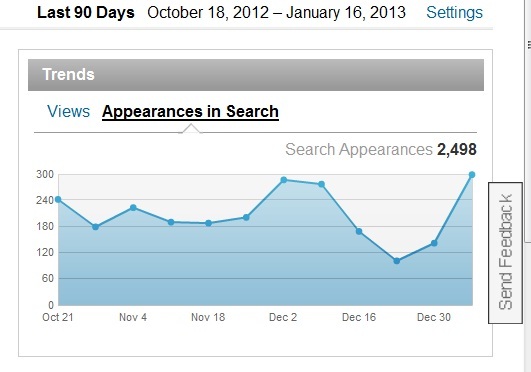 Study the search appearances graph over the last 90 days. 5. Go back to your main page and look again there at your stats. 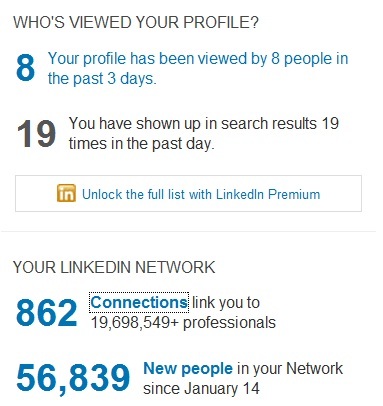 This time the stats of “YOUR LINKEDIN NETWORK” (see picture “Linkedin Connections and Network” above ) are in focus. There is a clear statistical link between the number of professionals within your Linkedin Network and Appearances in Search Results. The smaller your network the more likely your Linkedin Profile will not appear in searches. Why is that ? If you have still a small professional network the first thing you need to do is to connect to more people to enlarge your network as well as join the largest groups on Linkedin and also the Linkedin Groups related to your professional area. Member of your Linkedin Groups will also appear in Searches – so you do not have to be necessarily connected with these Profiles, they do not have to be part of your professional network. How do you identify the quality connections and the best Linkedin groups ? 6. First of all connect to all the people within your existing professional network that are on Linkedin. 7. Second look through your preferred job boards and identify the names of the recruiter if displayed or the company they are working for. Start searching for these recruiters or companies on Linkedin and see if you can connect to the individual. If these people are not yet within your reach in Linkedin see in which Linkedin Groups they are a member of. Join these groups. Now you should be able to invite them into your professional network. 8. Join large external industry groups and get a member list as well and join their Linkedin group if they have one already. 9. After you have started to extend your Linkedin Network see again if your Appearances in Searches went up compared to the first time you did your analysis. The next thing is for you to appear in the top search results. This is step No. 10. I would recommend you to take this step once you have a large enough network on Linkedin. From your own job searches in job boards as well as from the description of the open positions that you would consider extract the main keywords. This should be the words that recruiters will use to find a Linkedin Profile. 11. Use one of these keywords and do a search on Linkedin in the people category – see example in the picture below. The Search is on top right of your Linkedin Account Main Page. 12. The first result you get will be ordered by relevance. In this step you could analyse the first three top profiles and see how they used the keyword in their profiles. In Relevance mainly the people usually the first level connections will show up in the top ten results. 14. Now in the new result list study the top profiles that appear. See how and how often these Linkedin members used the keyword in their Linkedin Profiles. If you do not have the premium Linkedin membership you cannot view the Profiles of your 3rd Level connection or the Linkedin Members within your Linkedin Groups. On top the premium Linkedin Membership allows you to see what keywords were used by Linkedin Users who finally came to view your profile. Additonally with the Premium Version you can view the whole list of Linkedin Members who viewed your profile. Once you have optimised your Linkedin Profile it may be worth while to pay for the premium membership for some months to see what keywords attracted people to come to your profile. One of the key advises in the post – complete your Linkedin Profile in the most optimal way. “If you hope to come up in someone’s search for keywords related to your profile, you either need to essentially spam your profile with those keywords, be in a LinkedIn group related to those keywords, or you had better be connected with someone the person searching is connected to. Long story short, LinkedIn appears to favor networks of connected people, LinkedIn groups, and profiles chock-full of the same keyword(s).” Also the author Stephen Chapman – the SEO experts – shows some very good examples of his case study what I would recommend on how not do it. To be found is one thing, but to be attractive another. If it is obvious to a recruiter or a prospective client that you just optimized your Linkedin Profile to rank very high, this might turn actually your visitors to your profile away. I would advise you to study closely how to optimize but yet not loose the quality of your Linkedin Profile. To put it in other words very good products usually have also a very good marketing and so should a very good Linkedin Profile too. Stephen summarized his expert advise in two sections for seeking an employee and seeking a job. I recommend to read it. Some more useful advise also for company pages on Linkedin. If you teach your employees how to create compelling Linkedin Profile it will also benefit your brand as well your employer branding. This slideshare shows you what to consider. 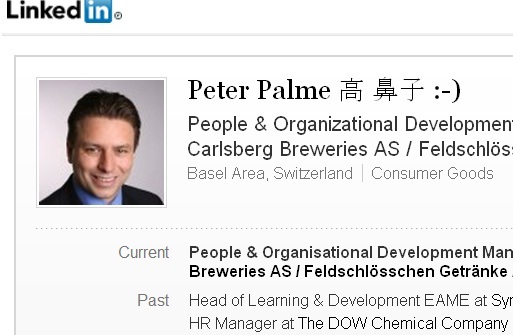 I was quite successful with my Linkedin Profile (www.linkedin.com/in/peterpalme) to attract Top Talents to my current employer who otherwise would not have considered us. In this excellent post you get a deeper insight on how Linkedin Search works when the search results are displayed by relevance. Worth reading. Linkedin How to Hide Your Job Hunt From Your Current Employer ? Is Linkedin helping you to find the next job or is it still a wishful thinking ? Retweet This Page: Did you ever wanted to know how attractive your profile is compared to others. Here is the opportunity for you to do an anonymous benchmark against other linkedin profiles. Please fill out these 6 questions anonymous survey. After filling in the survey you will see the overall results and can benchmark your data against it. You will see for example if you appear in more or less search results than the average linkedin profile, etc. What will be the impact of having more connections ? How many views does an average linkedin profile get ? The study will be send out on September 15th 2009 ? How many searches do you have to appear in to receive more than 40 calls from recruiters in 6 months ? Plus how to optimize your Linkedin SEO ? Official State Car: Theresa May vs Donal Trump, which one accelerates faster to 60mph? In a recent interview at Wharton, former Federal Reserve Chairman Alan Greenspan discussed recession fears, China’s growth and what the U.S. can learn from Sweden. Trustees and investment committee members need to acquire a basic understanding of financial instruments. The use of social media can help propagate already existing tensions and perhaps even push some potential perpetrators over the edge to carry out violent acts, according to new research on social media and violence against refugees in Germany presented today at the Royal Economic Society annual conference in Warwick. Governments keen to raise levels of educational achievement need to look at the cultures and attitudes of parents in high-achieving countries, not just national education systems – according to new findings from researchers at the University of Warwick and the Bank of Italy. The public science festival, Pint of Science, is returning to Coventry this year with experts from the Universities of Warwick and Coventry talking about their research work in a selection of pubs and venues around the city. Promising PhD candidates will have the opportunity to carry out their research and training in both the UK and mainland Europe, thanks to a new £500,000 joint investment in scholarships from the University of Warwick, l’Université Paris Seine (PSU) and Vrije Universiteit Brussel (VUB). There are no signs that the global economy is sliding toward a recession in the next 12 months, BlackRock Inc's Chief Executive Larry Fink said in remarks published on Saturday.